Arrive in Kathmandu, Overnight in hotel. 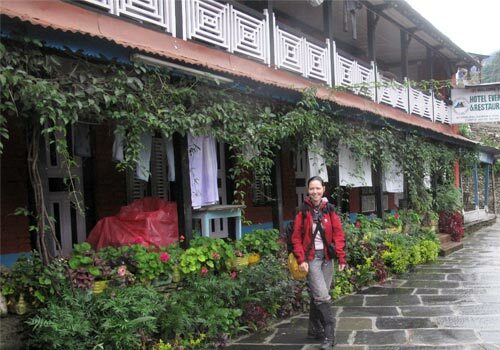 Itinerary Short ABC Trek starts after you arrive in Kathmandu our airport team transfer you to Hotel in Thamel. Trekking Trail Nepal official representative meet you over welcome drinks. 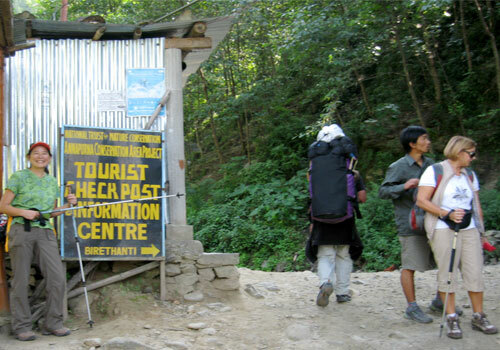 Details about short ABC trekking, Introduced the Trekking Trail Nepal guide and supporter. In addition to this, We will discuss all detail itinerary of Short ABC trekking. Drive towards Birethanti vai Pokhara, Overnight at side of Modi river. After breakfast in Kathmandu, You will start a 6-7 hour drive to Pokhara on Tourist Coach and 2 hours private car drive to Nayapul with Trekking Trail Nepal trekking staffs while we trek just for half hour to Birethanti 1050m. Today you can enjoy the Nepalese Highway, beautiful village, the roaring river and much unimaginable scenery of Nepal. Day 2 Itinerary of short ABC Trek will end with drive and trek to Birethanti. Trek to Jhinu, Natural Hot Spring. After breakfast, we will start our Short Annapurna Base Camp Trek towards Jhinu Danda 1770m. Here you can enjoy the natural hot spring on the bank of river Modi. To enjoy this, you have to walk little up and down for 15-25 minutes to reach the Hot spring pool on the bank of Modi River. Trekking trail on Day 3 of short ABC trek is mostly gentle. Till Sewi we will follow the newly constructed motorable trail after this little uphill to reach Simroong and Jhinu Danda. Now you can experience the thrill High Suspension Bridge to Connect Jhinu Danda and Simroong. This High Bridge not only adds adventure to this Short Annapurna Trek but save more time for Hot Spring Pool by shorting the trekking trail from stone falling cliffs. Short ABC Trek Itinerary of day 3 with Trekking Trail Nepal will conclude in Jhinu Danda ( Hot Spring ). Trek from Jhinu Danda ( hot Spring ) to Dovan. Trek from Hot Spring ( Jhinu Danda ) to Dovan 2600 m is relatively not easier in-compared with other days. Since we have to gain and lose few hundred meters of elevation frequently. But the close view of Mt Fishtail, Annapurna South, Himchuli along with green natural beauty and its mindful peace, roaring Himalayan river and local lifestyle of people living there makes easier to pass Choomroong 2110m, Sinwa and Bamboo behind us when we reach Dovan before evening. As itinerary of Short ABC Trekking will take you to Dovan for overnight. Trek to Machhauchhare Base Camp passing Himalaya and Deaurali. As Itinerary of ABC Short Trek, Today we will start trek from Dovan to Machhauchhare Base Camp 3700m. Trekking trail of today will follows Himalaya, Deaurali 3200m our lunch place and last part to Machhauchhare Base Camp is following narrow gorge of Machhauchhare on rightside and Hiunchuli and Annapurna South on left side along with stream coming down form Annapurna Base Camp 4130m. Early Morning hike to Annapurna Base Camp and exploration and trek down to Dovan. Today is the most important day of our trek from MBC to Annapurna base camp 4130m. after the four days of hiking in Annapurna Base Camp Trekking Trail. You will be in bowl of Himalayas, You can enjoy the 360 degree of Himalayas Including, Fungi, Hiunchuli, Annapurna South, Tent peak, Fishtail. Annapurna III, Ganga and Purna and many more including Mighty Annapurna I 8091M. After spending 1-2 hours in Annapurna Base Camp we will rock down to Dovan, following the same trekking trail of Annapurna Base Camp Trek. Day 6 Itinerary of Short ABC Trekking is the ultimate and beautiful day in whole Short Annapurna Base Camp Trek. 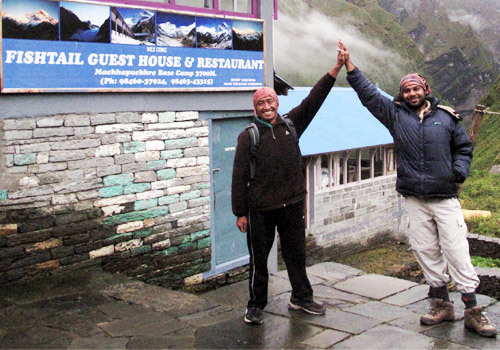 You will get the lifelong memories of being in Annapurna Base Camp 4130 m, by following the short trekking trail to ABC. Today we will trek from Dovan to Jhinu danda (hot spring) 1730m, following same trekking trail seeing all the picturesque mountain and nature behind us, taking in our memories and camera. Day 7 may be easiest hiking or toughest hiking for your in whole short Annapurna Base Camp. By the evening we will be in Jhinu Danda as the itinerary of Short Annapurna Base Camp Trek. Day 08: Trek down to Sewi and take enjoy the jeep drive till Pokhara. Overnight in Hotel near lake. Today is the last day of walking in the Annapurna Base Camp Trekking Trail ( Short ABC Trek ). Our day trek start from Jhinu Danda to Sewi and then we start our 4 wheel drive to Nayapul and Nepalese highway drive with green forest and the cool hill of Lumle and reach Pokhara before evening and itinerary of Short Annapurna Base Camp Trek end. Day 09: Drive back to Kathmandu. Overnight in Hotel. 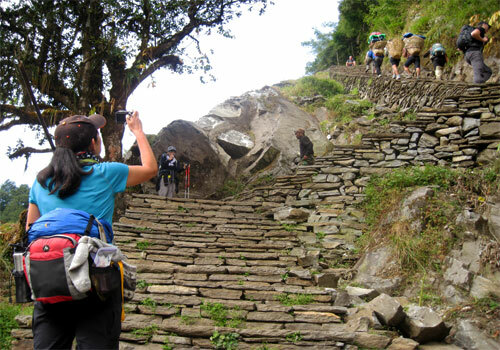 Itinerary of 9 of Short ABC Trekking is just drive day from Pokhara to Kathmandu. Today field staffs of Trekking Trail Nepal and guest will start drive back to Kathmandu. Following the same Highway of Nepal, Enjoying the lunch at river bank of Trishuli "Most Popular River For Rafting". Day 10: Extend your Trip or End of Short ABC Trek of 10 Days. The whole trip of Short ABC Trek as Itinerary ends on day 10. You can book more trip with Trekking Trail Nepal. After breakfast in Hotel of Kathmandu with Trekking Trail Nepal official. We will see you off to the airport for you Journey forward with memories and experiences with Nepal, Especially with 10 Days Short ABC Trek Itinerary. 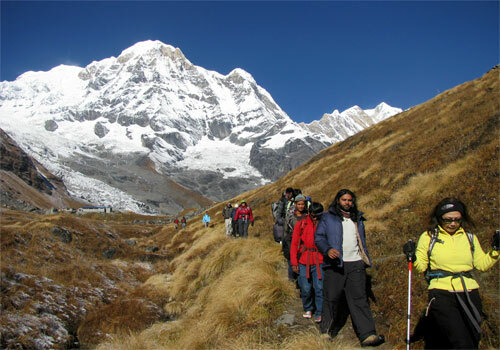 Trekking Trail Nepal transfer you to the Airport, with the hope to welcome you again in Nepal.